Selecting the right fabric plays an important role at any event. It helps uplift and define the looks of the decor. Econoline Polyester Sashes would be an ideal choice to accentuate the décor. Polyester gives these sashes the lustrous appeal which is perfect for matching the needs of your modern style furniture at events or parties. Choose from a comprehensive range of classy chair sashes, each boasting of a contemporary color combination, ready to impress your guests! 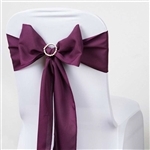 Chair Sashes are a great way of adding an extra element of flair to plain chair covers and table top decor. Our polyester sashes collection is ideal for weddings, birthdays, corporate luncheons, receptions, baby showers, retirement parties, holiday dining and other special events. 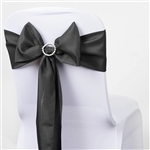 You can buy these chair sashes in a wide range of colors. Choose from our contemporary hues such as apple green, black, light blue, burgundy, champagne, chocolate, fuchsia (Hot Pink), gold, ivory, lavender, mauve, navy blue, coral orange, peach, periwinkle, pink, purple, red, royal blue, sage green, silver, turquoise, white, willow, yellow. Pair these wholesale chair sashes with our matching chair linens to give your event a touch of perfection. Econoline Polyester Sachets deliver perfect fitting across any size/type of chair. Polyester sashes wear an elegant sheen, giving your parties the luxurious touch it deserves! Why buy Chair Sashes from RazaTrade?